Fig. 8.2-6. Transverse section of cucumber (Cucumis sativus). 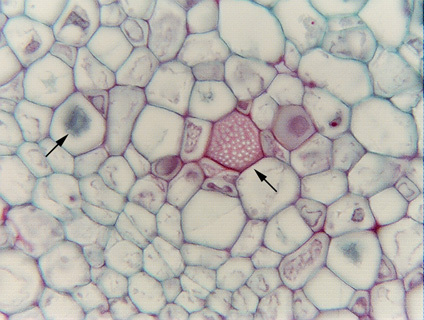 Teaching labs for Plant Anatomy almost always use samples of cucurbits (such as squash, pumpkin, cucumber) for showing sieve plates in transverse section. These plants have some of the very largest sieve plates of all plants, especially in the stalk of the developing fruit (the phloem must transport a lot of sugar rapidly if a tiny ovary is to develop into a giant pumpkin in just a month or two). This section of cucumber has caught a sieve plate (red structure at the end of the arrow) lying parallel to the plane of the section. The white dots are the sieve pores. The other arrow (on the right, pointing to a blue object) is indicating part of a P-protein plug.